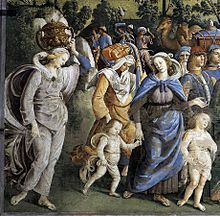 Detail from Moses Leaving to Egypt by Pietro Perugino, c. 1482. Zipporah is in blue. Zipporah or Tzipora (/ˈzɪpərə, zɪˈpɔːrə/; Hebrew: צִפוֹרָה, Tsippōrāh, "bird")[a] is mentioned in the Book of Exodus as the wife of Moses, and the daughter of Reuel/Jethro, the priest or prince of Midian. In the Book of Chronicles, two of her descendants are mentioned: Shebuel, son of Gershom, and Rehabiah, son of Eliezer. 1.4.1 Moses' only wife, or one of two wives? In the Hebrew Bible Zipporah was one of the seven daughters of Jethro, a Kenite shepherd who was a priest of Midian. In Exodus 2:18 Jethro is also referred to as Reuel and referred to as Hobab in the Book of Judges (Judges 4:11). Hobab was also the name of Jethro's son as recorded in Numbers 10:29. While the Israelites/Hebrews were captives in Egypt, Moses killed an Egyptian who was striking a Hebrew, for which offense Pharaoh sought to kill Moses. Moses therefore fled from Egypt and arrived in Midian. One day while he sat by a well, Reuel's daughters came to water their father's flocks. Other shepherds arrived and drove the girls away so they could water their own flocks first. Moses defended the girls and watered their flock. Upon their return home their father asked them, "How is it that you have come home so early today?" The girls answered, "An Egyptian rescued us from the shepherds; he even drew water for us and watered the flock." "Where is he then?" Reuel asked them. "Why did you leave the man? Invite him for supper to break bread." Reuel then gave Moses Zipporah as his wife (Exodus 2:11-21). After God commanded Moses to return to Egypt to free the Israelites, Moses took his wife and sons and started his journey. On the road, they stayed in an inn, where God came to kill Moses. Zipporah quickly circumcised her son with a sharp stone and touched Moses' feet with the foreskin, saying "Surely You are a husband of blood to me!" God then left Moses alone (Exodus 4:24-26). The details of the passage are unclear and subject to debate. After Moses succeeded in taking the Israelites out of Egypt, and won a battle against Amalek, Reuel came to the Hebrew camp in the wilderness of Sinai, bringing with him Zipporah and their two sons, Gershom and Eliezer. The Bible does not say when Zipporah and her sons rejoined Reuel/Jethro, only that after he heard of what God did for the Israelites, he brought Moses' family to him. The most common translation is that Moses sent her away, but another grammatically permissible translation is that she sent things or persons, perhaps the announcement of the victory over Amalek. The word that makes this difficult is shelucheiha, the sendings [away] of her (Ex. 18:2). Moses' only wife, or one of two wives? Moses' wife is referred to as a Cushite in Numbers 12. There are different interpretations on whether this Cushite wife was one and the same as Zipporah, or another woman; and whether he was married to them simultaneously, which would make him a polygamist, or successively. In the story Aaron and Miriam harshly criticize Moses' marriage to a Cushite or Kushite woman after he returned to Egypt to set the children of Israel free. Cushites were of the ancestry of either Kush (a.k.a. Nubia) in northeast Africa, or Arabians. The sons of Ham, mentioned within the Book of Genesis have been identified with nations in Africa (Ethiopia, Egypt, Libya), the Levant (Canaan), and Arabia. The Midianites themselves were later on depicted at times in non-Biblical sources as dark-skinned and called Kushim, a Hebrew word used for dark-skinned Africans. In the Druze religion, Jethro is revered as the spiritual founder, chief prophet, and ancestor of all Druze. 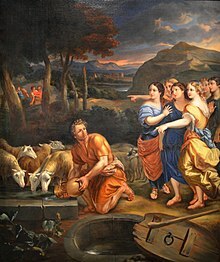 Moses was allowed to wed Zipporah, the daughter of Jethro, after helping save his daughters and their flock from competing herdsmen. It has been expressed by such prominent Druze such as Amal Nasser el-Din and Salman Tarif, who was a prominent Druze shaykh, that this makes the Druze related to the Jews through marriage. This view has been used to represent an element of the special relationship between Israeli Jews and Druze. Zipporah appears as a character in films such as The Ten Commandments (1956), The Prince of Egypt (1998) and Exodus: Gods and Kings (2014). She is the main character in Marek Halter's novel Zipporah, Wife of Moses (2005). ^ Harwood, Edith (1907). Notable pictures in Rome. J.M. Dent. p. 6. ^ a b Corduan, Winfried (2013). Neighboring Faiths: A Christian Introduction to World Religions. p. 107. ISBN 0-8308-7197-7. ^ a b Mackey, Sandra (2009). Mirror of the Arab World: Lebanon in Conflict. p. 28. ISBN 0-3933-3374-4. ^ a b Blumberg, Arnold (1985). Zion Before Zionism: 1838-1880. Syracuse, NY: Syracuse University Press. p. 201. ISBN 0-8156-2336-4. ^ a b Rosenfeld, Judy (1952). Ticket to Israel: An Informative Guide. p. 290. ^ "Judges 4 / Hebrew - English Bible / Mechon-Mamre". mechon-mamre.org. Retrieved 2014-04-05. ^ "Numbers 12:1 Miriam and Aaron began to talk against Moses because of his Cushite wife, for he had married a Cushite". biblehub.com. Retrieved 10 February 2018. ^ David M. Goldenberg. The curse of Ham: race and slavery in early Judaism, Christianity, and Islam, chapter 8. p. 124. ^ Lev, David (25 October 2010). "MK Kara: Druze are Descended from Jews". Israel National News. Arutz Sheva. Retrieved 23 March 2015. ^ Nettler (1998). Muslim-Jewish Encounters. p. 139. ISBN 1-1344-0854-4. ^ Mordechai Nisan (1 Jan 2002). Minorities in the Middle East: A History of Struggle and Self-Expression, 2d ed. McFarland. p. 282. ISBN 9780786451333. ^ Eugene L. Rogan; Avi Shlaim (2001). The War for Palestine: Rewriting the History of 1948 (illustrated, reprint ed.). Cambridge University Press. p. 72. ISBN 9780521794763. ^ Alex Weingrod (1 Jan 1985). Studies in Israeli Ethnicity: After the Ingathering. Taylor & Francis. p. 273. ISBN 9782881240072. ^ Thomas, Bob (12 January 2007). "Yvonne De Carlo, 84; Said Her 'Munsters' Role Made Her Hot". Retrieved 7 March 2018 – via www.washingtonpost.com. ^ "Fiction Book Review: Zipporah, Wife of Moses by Marek Halter, Author, trans. from the French by Howard Curtis. Crown $23 (288p) ISBN 978-1-4000-5279-0". Retrieved 10 February 2018. Piper, John (September 2007). "Did Moses Marry a Black Woman?". 9Marks.